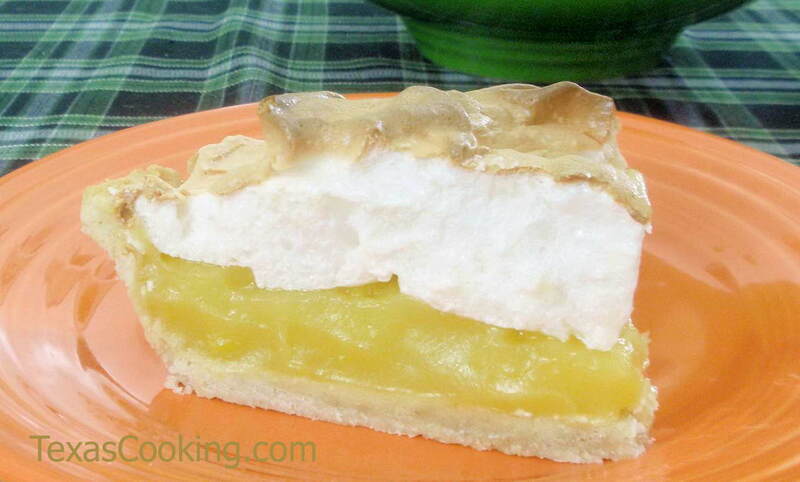 This is our famous recipe that results in the pie for all true lovers of Lemon Meringue Pie. It appears in an article featuring lemon pie recipes. Combine the sugar, flour, salt and water in a heavy saucepan. Stir constantly over medium-high heat until mixture boils. Boil, stirring constantly and vigorously, for 1 minute. (A long-handled spoon to stir with really helps here to get you back from the heat.) Remove from heat. Pour into cooled, baked 9-inch pie crust and top with meringue (recipes follow), sealing meringue to edge of pastry. Bake in a 350°F oven 12 to 15 minutes or until nicely browned. Note: Unlike many lemon meringue pie recipes, ours does not use corn starch nor sweetened condensed milk. The flour gives it a smoother texture. Be sure to seal the meringue to the pastry edge when spreading it on your pie. To minimize "weeping", spread the meringue on the pie filling while the filling is hot. Also, remember that meringue pies cut better with a wet knife blade. We talk more in depth about the meringue for this recipe in our post Secrets to Good Meringue.